Big Bluestem is a long-lived, perennial, warm season grass, and it is Missouri"s state grass. With time, it forms large clumps. While it has many roots in the top couple inches of soil, the deeper roots of this species may reach 12 feet or more deep. Native Americans used the long, jointed stems of Big Bluestem in the construction of earth lodges, and the young boys made toy arrow shafts from the stems. Various tribes also used it to treat digestive problems and fevers. The common name of Big Bluestem refers to the size of the plant relative to other species of bluestem and the bluish hue of the stems and sheaths. Turkey-Foot is another common name due to the resemblance of the seed head to the three "toes" on a turkey"s foot. Many bird species find shelter and a place to raise their young in amongst Big Bluestem plants; some birds will also occasionally eat the seeds of this species. Various mammals, from voles to bison, eat the foliage. The leaves are also eaten by grasshoppers, katydids, and the caterpillars of some skippers among other insects. 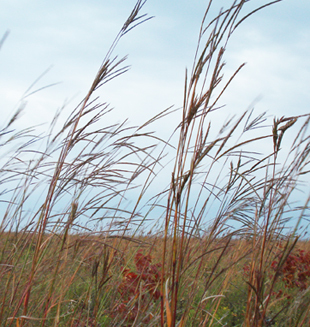 Big Bluestem is an excellent forage species, and without good grazing management, it will disappear from a grassland. It is highly palatable to many different classes of livestock including cattle, horses and goats. When grazing Big Bluestem, we find that leaving plenty of above-ground plant material following the graze will lead to a speedy recovery of the plant and the ability to rotate more quickly back to the pasture. The Plant Materials Center at Elsberry, MO found that the crude protein may begin the grazing season at about 17% while ADF is 27%, NDF is 52%, and TDN is 45%. While forage quality varies through the season, under good grazing management, Big Bluestem protein levels are usually adequate to get at least 2 lbs gain/head/day on a stocker. Big Bluestem can be grazed in the dormant season, but a protein supplement may be needed; it is best quality when grazed early in the dormant season. It should also be noted that by the end of winter the whole plant is generally lying flat on the ground; this is another reason to graze it quickly after frost, but the upside is that Big Bluestem forms an excellent armor of protection, or thatch, on the soil surface. Seeing that this plant often reaches heights of 8 feet or more in the fall, landscaping uses need to be carefully considered. It is often not used in wildflower meadows because of this. However, the plant has an interesting color that can add to a landscape; it generally starts the growing season as a grey to blue green color, and as the season progresses red colors may be spotted in the plant and the seed heads have a purplish hue. After frost, Big Bluestem has a reddish bronze color with some light purple notes. This species is tolerant of a variety of soils. Big Bluestem is a very common grassland species and is found in a variety of sites from dry to wet. It is often dominant on mesic sites. It is found in a variety of plant communities from prairies and glades to savannas and openings of upland forests. Being a warm season grass, this species doesn't form seed heads until fall, allowing most other grassland plants to flourish before it reaches a mature height.